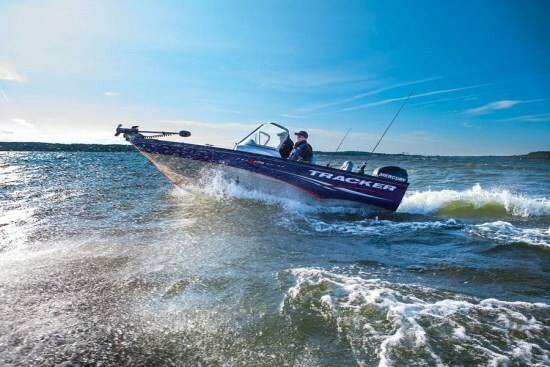 For 2013, Tracker Marine Group, headquartered in Springfield, MO, offers thirty-four models of Tracker aluminum bass, panfish, multi-species, jon, and utility fishing boats in four series from ten to twenty feet. 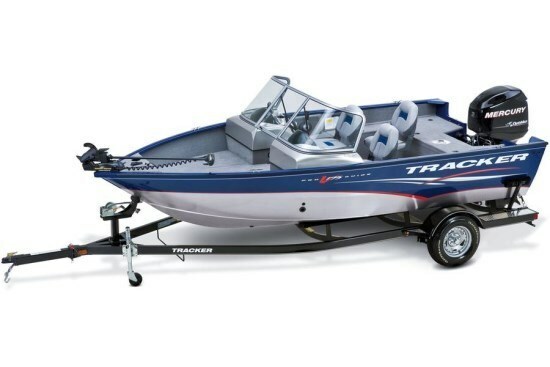 Tracker Marine Group also builds Sun Tracker pontoon boats, Nitro performance bass boats, and Tahoe sport boats. 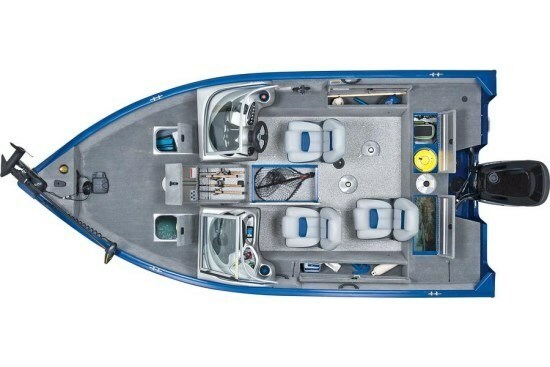 Tracker’s Deep V models feature all-welded aluminum construction consisting of a two-piece hull with a welded-in keel support where the two halves meet, a box-beam all-aluminum transom welded to the longitudinal stringer system which itself is hydraulically pressed into the hull, then welded in place. Extruded, welded-in chevron supports reinforce the bow while transverse bulkheads provide hull support. Foam injected into the hull cavities adds hull stiffening, flotation, and sound insulation. The “WT” (Walk-Thru) designation refers to the full-height windshield, providing great protection from the vagaries of our Canadian weather, but with a centre opening section allowing you to walk through it. This also means it has two consoles - one each for the driver and passenger. 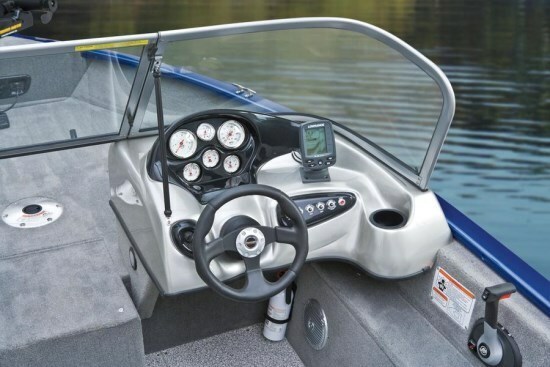 It also comes standard with three seats – one fixed helm seat with slide adjustment and two movable fold-down swivelling and locking fishing seats with “pinchless” hinges. These two seats can be placed in any of the six seat bases provided. Seat frames are of composite construction. The cockpit floor is vinyl covered while all other interior surfaces have grey cut pile carpeting. The helm console features a black metallic instrument & switch panel with recessed illuminated single-function gauges including speedometer, tachometer, voltmeter, fuel, trim, and water pressure. A Lowrance® swivel X-4 Pro fishfinder with surface temperature readout is standard. The passenger port side console includes a built-in storage/cooler compartment, small items tray, 12-volt outlet, and a standard AM/FM/CD stereo system with MP3 jack. 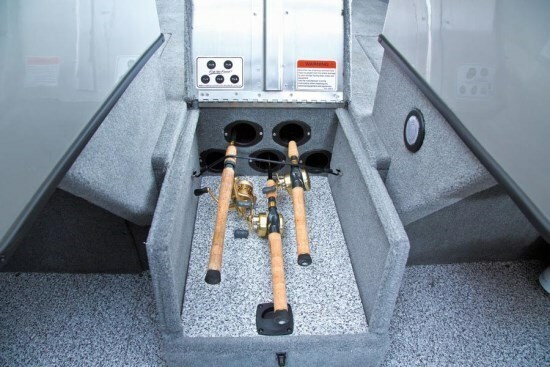 A center bow lockable rod box with designated organizer tubes for rods from 6'-8' plus two extra-deep top-loading lockable boxes in the cockpit sides for rods or gear up to 8' plus an in-floor center gear storage compartment plus a molded bow storage box plus an aft fishing deck storage compartment together provide lots of storage for your gear. In addition are midship and aft battery storage compartments. Two grey, aerated livewells are standard – a 19-gallon bow and a 29-gallon at the stern. Both come with timer recirculation, pump-out system, and removable bail bucket. 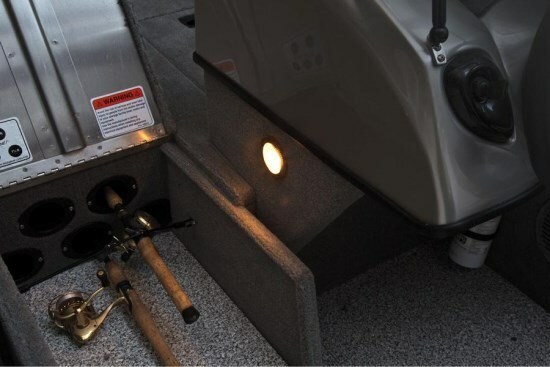 The bow trolling motor deck is carpeted and the bow panel includes a 12-volt outlet, and a motor tilt switch. Standard is a Minn Kota® PowerDrive™ 12V, 55-lb. thrust, 54” shaft, foot-control trolling motor. The Pro Guide V-175 WT’s standard colour scheme includes blue hull sides and gunnel with a red and white graphics scheme with a natural aluminum bottom. A custom factory-matched, colour coordinated, powder coated steel bunk trailer with swing-away tongue is standard. Standard power is from a Mercury 90 EXLPT FourStroke EFI. Top speed is estimated between 37 and 40 mph with this power. OptiMax® 2-stroke is also available. Maximum recommended horsepower is 135. There are very few options from which to choose but some are significant including a full bimini top with enclosure, or a convertible top, plus various useful accessories to complement the standard Versatrack® accessory mounting channel built in to the boat’s gunnel.